This little bird of the nightingale family with a great voice comes with some kigo related to it. The Acrocephalus warblers are small, insectivorous passerine birds belonging to the genus Acrocephalus of the Old World warbler family Sylviidae. They are sometimes called marsh warblers or reed-warblers, but this invites confusion with Marsh Warbler and Reed Warbler proper, especially in North America where it is common to use lower case for bird species. These are rather drab brownish warblers usually associated with marshes or other wetlands. Some are streaked, others plain. Almost all are migratory. Many species have a flat head profile, which gives rise to the group's scientific name. Species breeding in temperate regions are strongly migratory. Read more in the WIKIPEDIA ! was taken by the dog ! This hokku is placed at the end of a haibun dated 4/6 1810 that describes a happening Issa seems to have heard about in a village to the east of Edo. In the haibun a stranger of about 40 walks through the village, snatches an old robe that has been washed and is now lying drying on a fence running along the back side of one house, and then tries to leave the village with it stuffed inside one of his baggy sleeves. Villagers working in the fields see the clumsy would-be thief do it, chase after him, and catch him. They tie him up tightly using bamboo poles as if he were a dangerous criminal and parade him through the village. Along the way the villagers hang various heavy things from his arms and neck and taunt him, and then they accompany him playing gongs, bells, and drums, while others sing ritual songs usually sung to banish the god of plagues. This continues until the failed thief is finally released at the edge of the village. Issa says the villagers forgot what had actually happened, exaggerated the magnitude of what the man had done, and turned his capture and punishment into a form of entertainment and enjoyment for themselves. Given this context, the first line, gyougyoushi, a nickname for the reed warbler (which is said to cry gyou-gyou-gyou-gyou), also seems to mean another gyougyoushi (仰々し) meaning "extravagant, exaggerated, over the top, pompous," as suggested by the editors of the Koten Hai-Bungaku Taikei (Classical Haikai Library) 15:488, since what the villagers do to the man is precisely that. It's the beginning of the fourth month (about May), and the reed warblers have just returned from wintering in southern lands, so the reeds near rivers and ponds have suddenly become noisy again with the rather long, loud, and insistent cries of the reed warblers. In this hokku, Issa seems to be imagining the villagers bringing the tied, heavily burdened man to the river or stream that marks the border of the village and releasing/expelling him there. Here on the village border the loud music of the villagers is replaced by another form of loud "music" -- the rasping cries of reed warblers in the reeds. Perhaps Issa is suggesting that at this point it's hard to separate the humans from the birds.
. noonashi no nemutashi ware o gyoogyooshi . This hokku is from the fifth month (June) of 1825, when Issa was living in his hometown. Issa may be having a hard time sleeping, perhaps because of the late-night noise. It's summer, doors and windows are open, and he can clearly hear his neighbors in every direction snoring. 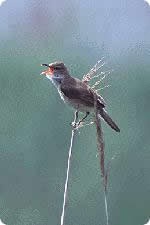 Then a reed warbler begins to cry with a loud, sharp, rasping, long-lasting cry, which it repeats over and over again. 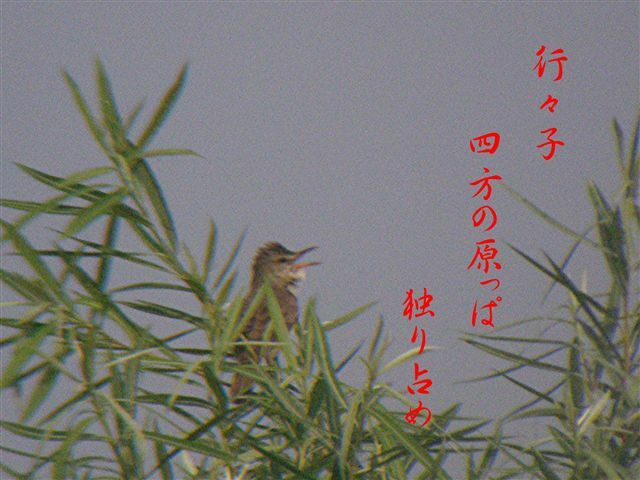 The word order in the hokku suggests Issa is humorously addressing the reed warbler, so I've added "please," which I think is implied. The last line might simply mean, "Please have some pity on this very noisy night," but I take it to mean something like, "Please, rush warbler, almost everyone in the village is sound asleep now and can't even hear you, and anyway, it's prime time for snoring. Even your loud cry can't compare with a village full of expert snorers." Issa may be referring to a deliberately contradictory Zen expression. In any case, he asks the noisy reed warbler to pay attention to the way the spoonbills communicate without crying out as they wade through the water near the reeds. In the summer, when spoonbills visit Japan, the mating season is over, and they rarely cry out. I've added "[please] listen" in the translation, since I think it is implied. Some scholars think Issa meant to write "the spoonbill made / a vow of silence" (mugon no gyou ya). If so, Issa would be referring to the way Japanese Buddhist monks make vows of silence as a supplementary form of meditation and prayer. In this case, Issa would be addressing a loud reed warbler and telling it metaphorically about the vow made by a local spoonbill. 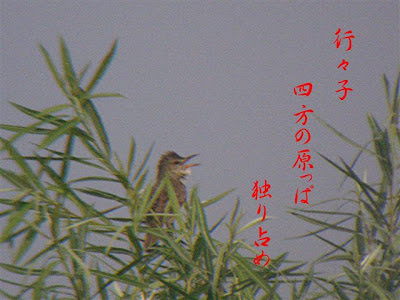 There would also be humor in Issa's use of gyou (行)three times: the first time to mean "ascetic practice/vow" and the second time, gyou-gyou, to form the main part of the name of the reed warbler. In Japanese the word for reed warbler, gyou-gyoushi, is onomatopoetic and means "the bird that cries gyou-gyou." So Issa would be asking the reed warbler to live up to its name and learn from the spoonbill, which wades silently near the reeds. The reed warbler in the hokku is presumably moving around the perimeter of its chosen territory at the reedy edge of a stream or river or lake. It is summer, when males are trying to carve out territory for themselves and invite one or more females into their territory, so the reed warbler in the hokku is probably stopping on various reeds and crying out its loud, shrill warning in many directions. The hokku is Issa's advice to the bird. He strongly urges the warbler to pay close attention to the way each reed stands firmly rooted, moving gently and quietly and at one with earth and water, and to learn from the reeds how to live -- and, it may be implied, to learn to be content with singing from a single reed rather than guarding hundreds of reeds as its private territory. The last two lines may mean simply "(please) attune your mind/heart to the way a single reed exists," though they seem to imply "(please) think/feel with the mind/heart of a single reed." The word kokoro- in the last line implies both mind and heart and thinking as well as feeling. 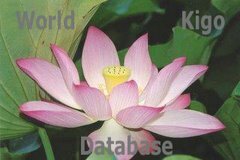 In Japanese Buddhism both animals and plants were and are commonly believed to have their own forms of sentience.